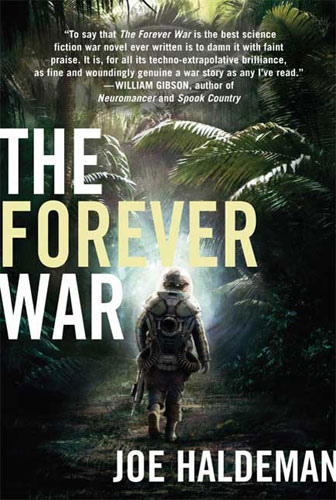 I recently picked up a copy of The Forever War by Joe Haldeman. I read his book The Accidental Time Machine and really enjoyed it. Apparently The Forever War is his masterpiece. The Forever War (1974) is a science fiction novel by American author Joe Haldeman, telling the contemplative story of soldiers fighting an interstellar war between humanity and the enigmatic Tauran species. The pithy, insightful explorations of the inhumanity of war and of bureaucracy, and of the psychological effects resulting from time dilation space travel (a soldier returns home after centuries away), won the Nebula Award in 1975, and the Hugo and the Locus awards in 1976. Inside the book are two pages of quotes praising this novel. And I’m not talking podunk newspapers, these are big time names such as: William Gibson, Greg Bear, Cory Doctorow, Stephen King, and more. It may be a little while until I can start on this book, but I’m really looking forward to it! I’ve heard about this book and understand it to be really good. Definitely give us a review once you’ve read it.